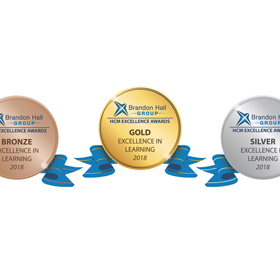 CrossKnowledge, along with its clients, won awards in two categories in the 2018 Learning Technologies Awards. The winners of the annual Learning Technologies Awards have been announced at a glittering ceremony in London, UK. Over 750 people gathered at the Park Plaza Westminster Bridge Hotel in London, UK, on 21 November to celebrate the very best in learning technologies across the world. 64 gold, silver and bronze awards were handed out. Entries were received from across the globe with around 30 different countries taking part. The judging partner was the eLearning Network and Global Benchmark partner was Towards Maturity. ING’s strategy is built around empowerment and the promise to customers to make banking clear and easy, available anytime and anywhere and to keep getting better. The Think Forward Strategy is crystal clear on where ING wants to play and how it wants to win. The Think Forward Leadership Experience amplifies behaviours and skills that leaders and managers need to create and maintain this culture. Take on board the stats: 5,000+ participants, a 16-week path, 96 participants per cohort, 94 learning objects, eight different learning technologies, five contributors, internal and external facilitators and much more. This seamless blend was unanimously voted amongst the winners in this incredibly tough category. The judges noted how the pedagogical excellence has not been sacrificed in the pursuit of business impact. Balancing the two demands is not easy but here, it has been done with style and in way that works for learners and the organisation as a whole. An interesting and innovative solution that the judges absolutely applaud. Founded in 1982 and headquartered in Copenhagen, Denmark, PANDORA, a global jewellery brand, employs more than 27,300 people worldwide. Around 13,200 are in Thailand, where the company manufactures its jewellery. In early 2016, PANDORA embarked on a major restructuring program to support its emerging needs as a global player. This included setting up a new Global Learning & Development team, tasked with providing more effective learning solutions and tools for the whole organization. PANDORA had to embrace the fact that it wasn’t a small company anymore, so they undertook a massive reorganisation, establishing entirely new regions and business units. The judges were impressed with the way the company implemented the CrossKnowledge platform, with only six weeks from kick-off to go-live. The aim was to improve governance and efficiency of training administration by putting in place a centralised system which allowed users to access learning materials on any device. Within the six weeks, the team had successfully imported 3,000 spreadsheets of user data and launched a global training campaign. The data provided indicated that the global administration and support burden had decreased significantly. The judges felt this was a great example of an agile implementation – going live with the minimum viable product, and then incrementally making improvements based on lessons learned. With more than 12 million users in 130 countries, CrossKnowledge is one of the world’s leading distance learning providers. CrossKnowledge solutions apply to companies and organizations of all sizes, successfully helping them execute their strategies, measurably developing competencies for each of their employees. They are built using world renowned content, social and mobile technology training expertise integrating the latest in educational research, and 18 years of experience and best practices for deployment. CrossKnowledge is part of the Wiley group. CloserStill Media runs market leading business exhibitions in the healthcare and technology sectors. We have events in London, Birmingham, Paris, Berlin, Frankfurt, Koln, New York, Hong Kong and Singapore. Our portfolio includes some of the fastest growing, and often award winning, events including the London Vet Show, Cloud Expo Europe, Data Centre World, The Pharmacy Show, Learning Technologies and The Dentistry Show.